Like the Duke Lacrosse case, Zimmerman’s prosecutors should be jailed for withholding key evidence and for prosecutorial abuse. 1) The prosecution deliberately withheld evidence favorable to George Zimmerman, just like district attorney Michael Nifong in the Duke lacrosse case. There will soon be a hearing concerning likely sanctions (punishment) against the Zimmerman prosecution for withholding key evidence that could have helped George Zimmerman in his trial. An employee of the Florida State Attorney’s Office, Ben Kruidbos, has testified that prosecutors withheld images from Trayvon Martin’s cell phone that shows Martin smoking marijuana, boasting about fights he’s been in, and deleted text messages regarding Trayvon’s efforts to purchase a firearm. The images and texts suggest that Trayvon was deeply involved in the gangster culture. Kruidbos, an IT expert, testified that he delivered the 900-page report to the prosecution in January of 2013, but that the prosecution did not turn this evidence over to the defense, as required by law, until mid-June, a few weeks before the trial. The defense was then unable to use these images and text messages in the trial because they were not given enough time to verify their authenticity. Kruidbos said that 2,958 photos were in the report given to the defense but that his report contained 4,275 photos. Kruidbos also said that he has been told to not put specific case-identifying information into internal e-mails. The Florida state’s attorneys office has now fired Mr. Kruidbos for blowing the whistle on them. This is exactly the offense the infamous prosecutor Michael Nifong was jailed for in the Duke Lacrosse case — withholding key evidence favorable to the defendant. In criminal cases, both sides are required by law to show the other side all their evidence — including evidence that is exculpatory or favorable for the defendant’s case. 2) Prosecutors are ethically bound to bring cases they are near certain to win. This was a classic case of overcharging (which happens all too often in America today). George Zimmerman never should have been on trial for second degree murder. There was not one shred of evidence that he had ill will, spite in his heart, or malice toward Trayvon Martin — a required pre-condition for second degree murder. And there was not one shred of evidence to refute George Zimmerman’s story — his self-defense claim. Chris Serino, the lead detective in the case interviewed George Zimmerman extensively. Police detectives are expert lie detectors. They know how to trip you up if you are lying. Detective Serino was convinced, and remains convinced, that Zimmerman was telling the truth. Serino also testified that when he played the recording of the 911 call that featured the scream and the gunshot for Trayvon’s father Tracy Martin, Mr. Martin said the scream was not his son’s. This is why the police released Zimmerman and no charges were initially filed against Zimmerman. The police believed, after an extensive investigation, that George Zimmerman’s self-defense claim was likely true. Prosecutors are ethically bound to only bring cases to trial they feel in their mind they are near-certain to win. That’s why most good prosecutors win 99 percent of their cases. The reason this principle is important is the state has near-limitless resources to spend on a prosecution. The ordinary citizen has very little resources. The prosecution clearly spent millions of dollars on the prosecution of George Zimmerman. Zimmerman’s defense must have cost at least $1,000,000. Good criminal defense lawyers charge $300 to $1,000 per hour. Zimmerman’s lawyers worked nearly full-time on this case for 16 months. Fortunately for George, this was a high-profile case. Donations poured into his website from sympathetic citizens at a rate of $30,000 per month in recent months, allowing him to pay at least a portion of his legal bills so he could mount a credible defense. Most citizens don’t have these resources. Most citizens are at the mercy of the prosecution — either have to rely on a young overworked public defender or on a solitary lawyer with no ability to fund their own investigation, replete with medical experts, use of force experts, forensic experts, gun shot wound experts, etc. Most ordinary citizens simply don’t have the means to mount a credible defense if the state is really out to get you. That’s why prosecutorial discretion and restraint is such a key principle in law. There was no prosecutorial restraint here. Instead, this win-at-all-costs prosecution knowingly tried to twist and misrepresent the evidence (much of this evidence actually proving the opposite of what the prosecution was attempting to prove) to put George Zimmerman in prison for 30 years to life. They even tried to portray Zimmerman’s desire to be a cop, his taking of criminal justice courses at a community college, and his starting of a Neighborhood Watch group as somehow bad things. To them, Zimmerman getting an A in his criminal justice course at a community college was supposed to be the real “Ah ha!” moment of this trial — proof that Zimmerman was up to something nefarious. That’s an abuse of government power and a deliberate effort to create a travesty of justice. This is mind-bogglingly bad behavior by these prosecutors, who are supposed to be officers of the court interested in truth. 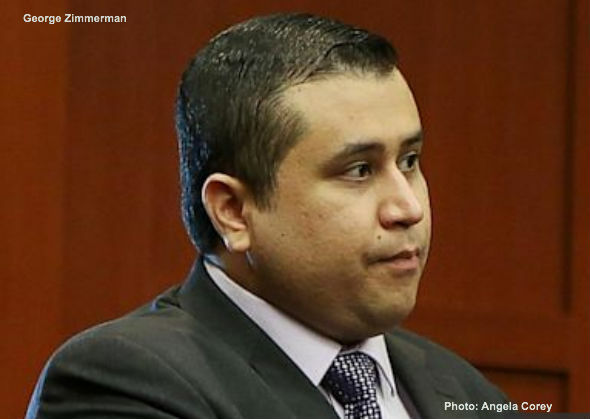 3) The prosecution showed malice toward George Zimmerman by the way it prosecuted this case. Prosecutor John Guy, in his passionate closing statement, told the jury to “look into your heart” and convict George Zimmerman of Second Degree Murder — which would have sent Zimmerman to prison for 30 years to life. How about look at the evidence and the law? The prosecution had not one shred of evidence to refute Zimmerman’s self-defense claim. So what the prosecution did was engage in character assassination and smear. This statement, by the way, seems to be true. There were a rash of burglaries and home invasions in this community within weeks of this event, which was in a crime-ridden neighborhood. George Zimmerman started this Neighborhood Watch group because of all the crime. My wife has sometimes told me “You’re an f—–ing a—hole” . . . when, frankly, I’ve acted like one. Do I take this to mean she has malice in her heart towards me? Do I take this to mean that she’s a bad person because she has, on occasion, used language like this? Of course not. I take it has an expression of frustration on her part over something I’ve done or not done. She’s pissed off. I’ll then take immediate steps to make amends, to correct my behavior. The prosecution withheld the mountain of evidence that showed George Zimmerman was not a racist. He mentored African-American kids. In high school, he took an African-American date to the prom. His African-American neighbor testified that George Zimmerman was a wonderful person who cared deeply about the people in that community, many of whom are African-American. But the prosecution wanted to portray George Zimmerman as a bad guy by taking a single quote (“f—-ing punks”) out of context, as if that quote means anything. The prosecution essentially tried to win this case by name calling. The prosecution also wanted the jury to believe that George Zimmerman is a liar and therefore a murderer (an enormous illogical leap) because of inconsistencies in some of the details of his multiple recountings of the event. In the Casey Anthony case, she was proven to be a liar. But the jury did not think this was proof that she should be executed for capital murder. Lead Detective Chris Serino saw the same inconsistencies in Zimmerman’s stories. He saw these inconsistencies in the details as insignificant. But the prosecution made a huge deal of these inconsistencies or what they saw as implausibilities to argue that Zimmerman is a liar and therefore guilty of murder. George Zimmerman told police Trayvon banged his head on the cement sidewalk probably 25 times. Did Zimmerman, perhaps, exaggerate the extent of the beating he took in order to lend more credibility to his self-defense claim? Probably. I would say almost certainly he exaggerated. But Zimmerman’s probable exaggeration does not change the core truth of his claim and what the medical and forensic evidence shows — that George Zimmerman was taking a beating from Trayvon Martin, who was four inches taller than the soft 5′ 7″ Zimmerman. Moreover, the only real eye witness to the event, John Good, testified that he saw Trayvon on top of Zimmerman delivering blows downward, MMA style. He also testified that he saw and heard Zimmerman screaming for help. The prosecution had all this evidence, but moved forward with the prosecution anyway. Prosecutors tried to make the case that Zimmerman is a liar (and therefore guilty) because he told police he needed to check the name of the street. Prosecutors said Zimmerman should know the name of this street because there are only three streets in the community in which he lives. I could not tell you, for certain off the top of my head, the names of the streets that connect to the street I live on. I cannot tell you my wife’s cell phone number because I have it on speed dial. Perhaps George just wanted to be sure of the name of the street he was telling police. No evidence of lying here. But the prosecution tried to blow this up as a big lie – and therefore, the prosecution suggested to the jury, Zimmerman must be guilty of murder. The prosecution repeatedly misrepresented to law to the jury. The prosecution did this by trying to minimize the extent of injury to Zimmerman’s head, saying these injuries were not life threatening. But ending up with serious injuries is not necessary for self-defense. Reasonable fear of serious injury is what’s required. The prosecution of course knew the law, but sought to misrepresent the law concerning self-defense to the jury in order to secure their conviction. The prosecution did everything in its power to confuse the jury about what the law concerning self-defense actually is. We expect defense lawyers to try to win their case by confusing the jury. That’s what O.J. Simpson’s lawyers did successfully in his murder case. But we don’t expect the prosecution to use this tactic — the tactic of creating as much confusion as possible. The prosecution’s strategy in this case was to throw as much mud at George Zimmerman as possible, and then see if some of it sticks. What will stick, of course, is the smearing of George’s character. At least, some of that will stick. George Zimmerman’s life is likely ruined. How will he get a job? What employer will want to become a target of an angry mob for hiring George Zimmerman? How will George Zimmerman even be able to make a trip to the grocery store without risking being attacked? Prosecutors are officers of the court and agents of the government. They have an obligation to present evidence fairly, all the evidence — including evidence favorable to the defendant. Prosecutors are supposed to be primarily interested in finding the truth and pursuing justice — true justice. Prosecutors are supposed to only bring cases if they are certain in their own minds they can win. They are not supposed to bring cases they might win. They are not supposed to lie or mislead the jury to win their case through over-heated emotional appeals not based in fact or law. This prosecution presented not one shred of evidence to refute Zimmerman’s claim of self-defense. They relied entirely on emotion and character assassination on the hope that they could get this jury to hate George Zimmerman so much as a person, that perhaps this jury would convict Zimmerman of something, even if there were no facts presented to support conviction. At the last minute, before closing arguments, the prosecution wanted to add a new charge — third degree murder, where a child dies due to child abuse. Trayvon Martin was 17 years old, 5′ 11″ — four inches taller and far more athletic than than doughy 5′ 7″ Zimmerman. Judge Nelson rejected the last-minute murder by “child abuse” charge. Of course, the prosecutors know there was no “child abuse” here. But they wanted to add that as a charge because they know “child abuse” is an explosive phrase that might cause these six moms on the jury to recoil in horror and really hate Zimmerman. The two prosecutors spent most of their closing statements yelling and screaming at the jury, slamming Trayvon’s Skittles on the table for emotional effect. Prosecutor John Guy kept repeating this nonsensical phrase he must have grabbed from Bartlett’s Book of Quotations: “You owe the living respect. You owe the dead the truth” — as if this phrase has any meaning at all in this case. John Guy thought this phrase so important and profound that he repeated it at least three times to the jury. That’s what this prosecution did. They did not have the facts or the law on their side. So they wasted millions of dollars of taxpayer money trying to win this unwinnable case on emotion — by getting the jury to hate George Zimmerman as person — by taking his statements out of context, by twisting evidence, and by presenting everything Zimmerman did in the worst possible light, never entertaining other more plausible explanations. These prosecutors were not interested in truth or justice. They just wanted to win at all costs. They wanted to win by misleading the court and the jury — by intentionally and deliberately painting a false picture of George Zimmerman. This was a malicious prosecution that never should have occurred. These prosecutors are evil people. They are evil people because they misused the machinery of government to engage in character assassination and smear of an innocent man. They intentionally withheld key evidence from the defense, the court, and the jury. They are evil because they knew they had no case but attempted to put an innocent man in prison for the rest of his life anyway by ginning up hatred for George Zimmerman in the jury. Fortunately, the jury saw through all this. They acquitted George Zimmerman unanimously of all charges. But now where does George Zimmerman go to get his reputation back? (to quote President Reagan’s former Labor Secretary Ray Donovan after he was acquitted in his trial). Like Michael Nifong in the infamous Lacrosse case, these prosecutors should serve jail time for abusing their office to engage in a malicious prosecution against a very decent man, George Zimmerman. Submitted by mikey0773 on Wed, 07/17/2013 - 08:53. Since Mr. Obama's coronation, this country has not been so racially polarized since the days of segregation. This is a craven political policy of the current administration. The progressive left broadens its base, daily, by creating an entitlement class, composed mainly of Afro-Americans and Latinos. They pander to them to keep them energized. The Zimmerman matter was fomented by the likes of Al Charlatan, Jess-eh and the usual gang of suspects. This case was an example of racial politics. This Angela Corey creature is an ambitious politician, who will do anything to further her ambitions, including perjury. It is a fact that Martin's father initially denied the voice on the tape was his son's. It is a fact that there was an eye witness who supported Zimmerman's version of the encounter. It is a fact that the 911 operator never told Zimmerman not to follow Martin. It is a fact that there is a four minute gap between the time the "cracka" phone call ended and the altercation began. It is a fact that Martin banged Zimmerman's head into the pavement a number of times. It is a fact that Martin used mixed martial arts to pummel Zimmerman. These are facts that were known as a result of initial investigation and why the police did not arrest Zimmerman. Yet, knowing these facts, exculpatory evidence, Creature Cory submitted a false Affidavit of Probable Cause to the court - PERJURY. Only after organized demonstrations was Zimmerman arrested. Only after protracted litigation was the defense able to obtain evidence favorable to Zimmerman. Mr. Hart is correct in comparing the prosecutors to Nifong. Who is going to investigate the civil rights violations against Zimmerman? The federal government has no jurisdiction. Zimmerman was not an employee or an agent of any governmental entity. That other race baiter, now wants to investigate state laws. If anything, Zimmerman might be civilly liabe in a wrongful death suit, á la OJ. Submitted by ronnine on Tue, 07/16/2013 - 18:01. Forget Zimmerman, he's a murderer protected by the law. The real trial should have been a prosecution of those members of the Florida state legislature who voted for the right to commit murder; of Jeb Bush who pushed for the law; of the agents provocateur Koch brothers; of NRA leadership; and any others who hope to divide and conquer solely for the opportunity to lower their taxes. Read the Bible gentlemen ... you are idolators who worship money and apparently ignore Christ's admonition that "that which you do to the least of these, you do also to me." Submitted by bgoccia on Tue, 07/16/2013 - 09:07. Outstanding piece, Mr. Hart! I did not know about the whistleblower. Martin's size has been in dispute. I read his parents claim he was six foot two and a hundred and sixty pounds, although the police say he was six feet and a hundred and fifty. I understand why you went on the conservative side. Any way you slice it, he was not the cute little cherub they first showed on television. This thing was always about getting the black vote out for Obama and giving him another gun control and race issue to promote. Submitted by ONTIME on Mon, 07/15/2013 - 12:46. To many this is just another example of how intrusive and corrupt this illegal administration of non transparency has become, the arrogance has once again reached out to persecute a victim in order to acchieve a verdict they wanted. They not only wanted to corrupt the verdict they colluded with other black racist who threatened to incite racial riots and some made attempts to influence the jury. The prosecuting attorney withheld evidence and was rebuked by one of her own staff who had the integrity to quit when he condemed her publicly..congrats to this individual. Submitted by ONTIME on Mon, 07/15/2013 - 12:30. In America, you are innocent until proven guilty, it puts the burden on the accuser and there are countries by the score around the world who would love to have our judicial system. It is not perfect was not meant to be, there are a 186 areas of jurisprudence thus allowing precedent to be a comparison. The jury of six ladies is to be congratulated, they stood tall in a court under siege, being threatened by our government for a conviction, the NAALCP and other black racist calling for race riots should they not get a guilty verdict. Justice and the rule of law prevailed under these difficult circumstances and I know that Dr. King would be standing and applauding these ladies for their courage to uphold the law.. Submitted by mbfas on Tue, 07/16/2013 - 14:45. Abused wife gets 20 years for shooting warning shot in Florida?http://www.youtube.com/watch?feature=player_embedded&v=4pS3Sg11T1s The daily show last night had a good take on what a joke Florida law is in reference to this vs. Zimmermanhttp://www.youtube.com/watch?feature=player_embedded&v=OTMmTvao1jc In the end which crime deserved punishment more?You have to wonder why Zimmerman didn't show his gun because there would have been no fight. The assumption that he was attacked first doesn't make sense because he was stalking to begin with. I just don't buy his story. Zimmerman is a liar, he's assaulted a police officer and had a restraining order against him from an ex. I wouldn't defend him either. If the kid had been burglarizing his home and he shot him then I'd say he was justified. He should have let the police do their job....not tried to do it for them. I hate that he's out on the street & I'll bet he will kill again if he gets a chance if someone doesn't kill him first. Something not right about that boy. No remorse really. The prosecution was wrong to withhold evidence but if you are going to bring up Martin's past then that opens up Zimmerman to scrutiny....so they didn't want to go there anyway. Submitted by sudyrand on Tue, 07/16/2013 - 20:43. You are just another low info, low life. You don't look at the facts, just what the msm spoon feeds you. You are also too stupid to tell the differences between truth and lie. Maybe you will be confronted someday, with a life or death situation and if you are, you will probably beg and cry at the perps feet. So crawl back under the rock you came from and let those of us who can tell the differences resume our lives. Submitted by ronnine on Fri, 07/19/2013 - 01:10. I am saddened in general by the low level of discourse and in particular by your vituperative comments to the so called "low info voter." I may be wrong, but I sincerely doubt that you would know this person from "Adam's Off Aunt!" Nevertheless you apparently have no problem whatsoever in using insulting language in your text, predicated upon mere assumption!